More trickery: If Speaker Pelosi manages to get 216 members of the House of Representatives to walk the plank on Sunday and vote for her health overhaul — against the overwhelming will of the American people — President Obama plans to immediately sign the massive 2,700-page bill into law. ObamaCare will be the law of the land, with its $2.4 trillion in new government spending, jobs-killing mandates, huge tax increases, Medicare cuts, and scores of new government bureaucracies. Whether the Senate can pass the second 153-page bill released yesterday is an open question. Too many people, including journalists and TV commentators, are saying that the whole package will then be sent to the Senate. Only the 153-page fix-it bill goes to the Senate. That's the whole point of the deem-and-pass Slaughter strategy: Get the big bill passed and signed into law while the American people are focused on the narrow issue of what the Senate does or does not do to pass a second health reform bill through its narrow reconciliation pipeline. Will they all be blindsided if ObamaCare becomes law on Sunday night? The trickery seems to know no bounds! Fix-it bill? This so-called "fix-it" bill, released yesterday at the behest of the House, makes a bad Senate bill even worse: It adds more entitlement spending and Medicare cuts, further increases taxes on the middle class, and double-counts savings in a way that would make Bernie Madoff blush. It is pure fiction that the package of two bills will reduce the deficit by $138 billion over 10 years. As former CBO director Doug Holtz-Eakin said in a media conference call we hosted yesterday, "The numbers simply aren't plausible." I wrote about this here in my latest post for National Review, "A shell game of tax increases and Medicare cuts." "Bye bye, Cornhusker Kickback. Hello, special treatment for Tennessee and North Dakota. Democrats unveiling revisions Thursday to their health care overhaul bill decided to kill the extra $100 million in Medicaid funds for Nebraska that has become a symbol of backdoor deal making. But the 153 pages of changes to the massive health care package include extra money for hospitals in Tennessee that serve large numbers of low-income patients … Still alive is special spending for Louisiana, Connecticut, Montana and other states that was included in the health care bill that the Senate approved in December." Sen. Tom Coburn of Oklahoma put any House member on notice who switches from voting No last November to Yes on the final bill. They should be forewarned if they retire or are defeated at the polls in November and think they will then get an administration appointment that requires Senate confirmation (Rep. Bart Gordon, NASA Administrator?). He said he absolutely will put a hold on Senate confirmation of their nomination, assuming that the nomination was a pay-back for their vote for ObamaCare. And Dr. Coburn said that he and the staff of seven other senators will be scrubbing every future bill introduced to see if there is pork for any district as a payback for a yes vote. Constitutional challenges to this legislation are inevitable and will tear the country apart as states pass laws refusing to comply, the Congress becomes paralyzed, and lawsuits abound challenging both the content of the law and the way it was "deemed" to have passed. Fred Barnes had a chilling piece in The Wall Street Journal yesterday called "The health-care wars are only beginning." This will be a terrible thing for our country to go through. We have an ad running on satellite radio that you can listen to here. We placed a full-page ad in this week's Weekly Standard magazine with a terrific graphic designed by our own Jena Persico. 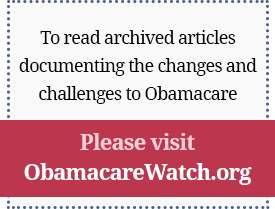 I wrote an article in The Wall Street Journal, published on Wednesday, with a detailed look at the problems in Massachusetts that preview where the country will be headed if ObamaCare passes. Another article on The Daily Caller website called "ObamaCare backers should get ready to play defense." An article in National Review today about the fictional CBO numbers that Democratic leaders said made them "giddy." Blue Dog Democrats may well want to ask themselves whether the risk of this massive experiment in overhauling one-sixth of our economy and creating a huge new entitlement program would be worth taking the chance that these highly unlikely deficit savings will be achieved. Countless radio interviews plus my latest interview on FOX Business' Stuart Varney Show today with guest host Connell McShane. Finally, you have to watch this very short video! Americans for Prosperity asked volunteers to stand on the four corners of an intersection outside the district office of undecided Democrat Rep. Gabrielle Giffords of Tucson, AZ. They hold signs asking people to honk if they oppose health reform. The sound is deafening as virtually every driver lays on the horn. Why can't they hear us?! Upcoming conference: To bring some sanity to health policy discussions next week, we are sponsoring another in our series of conferences on the value of innovation in health care. Please join us this coming Thursday (March 25) in Washington, DC, for a conference on "Intelligent Health." This highly bipartisan topic will provide an opportunity to look ahead as we hope our health sector will continue to provide high-quality, innovative medical care. Health technology guru Dr. David Brailer is our keynote speaker, and we have four fabulous panels of experts talking about personalized medicine, new technologies to connect physicians and patients, streamlining the process of drug development and approval, and the vital importance of intellectual property protection. Our luncheon speaker will preview the operating room of the future. Please do register and join us. It is free and will be at the lovely Columbus Club at Union Station. This will be well worth your time. Here is more information so you can see the agenda and register. It's not over yet! And in the words of Winston Churchill: "Never give in. Never give in. Never, never, never, never — in nothing, great or small, large or petty." Kathryn Nix and Robert E. Moffit, Ph.D.